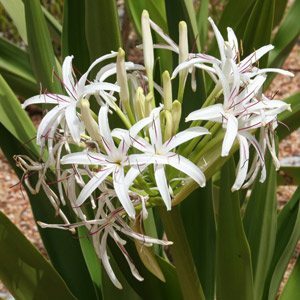 Known as the ‘Swamp Lily’, and sometimes ‘Mangrove Lily’, Crinum pedunculatum is a native plant that is actually very tolerant of both dry and wet conditions. It is mostly found in damp swampy conditions besides slow moving streams, however with a little care it also makes an excellent garden plant. The foliage reaches up to 1.5m in length and is wide and strappy. Over time Crinum pedunculatum forms a large tussock although it does look great as a single specimen. The flowers are large with a bloom consisting of 10 – 20 white flowers with pink stamens setting of a nice contrast. Flowers are held high on stems to 50cm. Seen here growing at the Botanical gardens (Cranbourne) it makes a wonderful specimen plant, bold foliage and attractive flowers. Being a very versatile plant Crinum pedunculatum can be used in a number of landscaping applications. It will grow well in containers, and is well suited to general garden use. Although it prefers moist conditions, which make it suited for planting nears ponds and streams, it will also grow well in drier conditions. It is also adaptable in terms of light, growing well in shade as well as full sun. Best grown in moist soil in a position where it receives some protection from the afternoon sun. In its natural habitat, Crinum pedunculatum is found from Queensland to New South Wales, however it grows well as far south as Melbourne. Frost tolerant and relatively pest and disease free. Propagation is easy by division of established clumps or from seed. 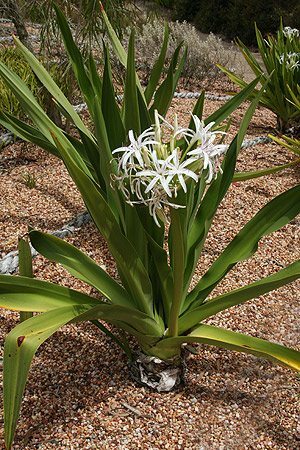 Botanical Name – Crinum pedunculatum. Common Names – ‘Swamp Lily’ or ‘Mangrove Lily’. Height – To around 2.5 metres depending on conditions. Spread – This is a clump forming plant, an individual specimen can have foliage that spreads to around 2.5 metres. Flowers – White on tall stems. Foliage – Strap like and mid green. Soil – Humus rich and moist, however tolerant of dry periods. Tolerates boggy soils well. Division of established clumps is the easiest form of propagation. Also possible from seed.